Leading The Way Episode Reminder Get a sneak-peek into each new show, delivered straight to your inbox! Along with partners committed to changing the world, Dr. Michael Youssef is leading the way for people living in spiritual darkness to discover the light of Christ. By passionately proclaiming uncompromising Truth through print, web, television, and radio, this international team of experts is uniquely providing hope that is revolutionizing lives at home — and around the world. What began as a small local radio ministry in 1988 has grown into an international ministry reaching millions for Christ — including a vast audience in the Muslim world seeking Truth in closed countries. Leading The Way's television and radio programs are broadcast in more than 25 languages to audiences across six continents. Leading The Way also produces DVDs, CDs, books, a monthly devotional magazine, solar-powered Navigators, and daily e-devotionals to spread the light of Christ. In 2009, the ministry launched its own 24/7 satellite TV channel, reaching the Muslim world with Gospel programming in English, Arabic, French, and Indonesian. Leading The Way utilizes field teams to evangelize and disciple viewers in closed countries and help persecuted Christians on the ground. Dr. Youssef and the Leading The Way staff are committed to sharing the Gospel with the lost and equipping believers to grow into a deeper walk with Christ. Learn how you can partner with this unique ministry today. 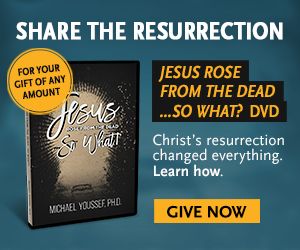 Michael Youssef, Ph.D., is the Founder and President of Leading The Way with Dr. Michael Youssef, a worldwide ministry that leads the way for people living in spiritual darkness to discover the light of Christ through the creative use of media and field ministry teams. His weekly television programs and daily radio programs are broadcast more than 13,000 times per week in multiple languages throughout the world. He is also the founding pastor of The Church of The Apostles in Atlanta, Georgia. Dr. Youssef was born in Egypt and lived in Lebanon and Australia before coming to the United States. In 1984, he fulfilled a childhood dream of becoming an American citizen. Dr. Youssef holds degrees from Moore College in Sydney, Australia; Fuller Theological Seminary in California; and a Ph.D. in social anthropology from Emory University. He has authored more than 30 books, including his most recent, Fearless Living in Troubled Times. He and his wife reside in Atlanta and have four grown children and 10 grandchildren.